Actually, it is an excellent book. Lee writes about the difference between anger and rage. He maintains that anger is an essential emotion that most people experience weekly, if not daily. “If anger is expressed appropriately,” Lee writes, “it equals energy, intimacy, and peace of mind. But unhealthy/destructive [his emphasis] is what causes everyone pain.” Destructive anger is rage—what Lee labels as an action or a behavior as opposed to the emotion of anger. 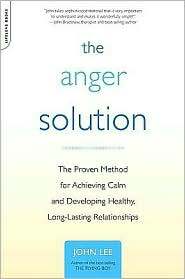 The book examines why people fly into rage—become addicted to it; and what can be done to control or eliminate rage. While rage might feel good at the time, it weakens the person raging and the person on whom the rage is dumped. While the entire book is compelling, one part grabbed my attention in particular. In describing The Detour Method, Lee devoted a number of pages to the concepts of “boundaries” and “limits.” At first, I felt he was playing a semantic game. After all, if I set a boundary is that not a limit? It took me a couple of reads to understand the difference. Let me do my best to explain how setting boundaries and understanding limits can make for a more satisfying life. Boundaries show where we “begin and end” according to Lee. They let others know what is acceptable and unacceptable. They tell people how far they can go with another person. When boundaries are clearly established, there is no ambiguity. Example: Dominic takes Marie on a date. Nice dinner, movie, a couple of drinks later in the evening. Marie let Dominick know before the date, that this would be an evening to enjoy each other’s company—but nothing else. No invitation to come inside; no sexual encounter. Just dinner and conversation and friendship. That is a clearly set boundary. Marie has let Dominic know what acceptable and unacceptable behavior is on the date. Example: Professor Serra tells his students they can contact him by email or his campus phone. He will answer students as soon as he possibly can. He will not, however, take any phone calls at his home. He has set a clear boundary for his students. Example: The boss expects all employees to be present for the staff meeting. That is, they need to be physically and mentally in the room. The new rule: All phones will be in the OFF position. There will be NO texting, NO phone calls, and NO web surfing during a meeting. NO exceptions! Lee maintains that “boundaries can reduce tension, friction, and misunderstanding…we don’t have to worry about encroachment, abandonment, invasion, or oppression.” They tell people where they can go or not go as it relates to you. Limits let people know how far you will go. They clearly tell people what you will do or will not do. If established correctly, people are not left guessing about what to expect from you. People without clearly established limits will end up giving more (physically, emotionally, occupationally) than they want to give. This can result in resentment, hurt feelings, or even rage. But, you do it to yourself. Example: Janni has a son, Josh, who is in middle school. She gladly and lovingly makes him a nutritious lunch each day. However, lately, Josh forgets his lunch two or three times a week. He calls home from school and Janni runs the lunch to him. Finally, Janni told Josh she would no longer bring his lunch to school. If he forgets it, he will not have lunch that day. Sure enough, the next day, Josh forgot his lunch; he called home; and Janni calmly told him she would not be able to bring his lunch to the school. She had set a limit on what she would do. Example. Professor Yotch told her students she will read any and all rough drafts of their papers up to 3 days before the due date. After that she will not take them as she will need to devote time to her other class assignments. Anything that comes in after that deadline will be returned to the student without comment. She has maintained this policy for the last four semesters. Example: Jerry has been car pooling with Tony for the past few months. Tony insists on talking on his cell phone and texting while driving. Jerry has told Tony this is not safe and has asked him to stop. Tony continues his unsafe practices. Jerry will no longer car pool with Tony. One way that I keep the two clear in my mind is to consider that boundaries are for others and limits are for me. As I read Lee’s book I thought about the times that I have been angry and frustrated with others because they caused me to lose time/work late/take on extra tasks. In many of those instances, as I think back, it was because I did not establish a clear boundary for them or a clear limit for myself. Boundaries and limits can be adjusted along the way based on additional information. But for them to be effective and healthy they have to be clear to both us and those with whom we live and work. This entry was posted in boundaries and limits. Bookmark the permalink. Wow! Great to hear from you. Thank you for the kind words. I really worked with this as I did not want to misrepresent your good work. Thanks for the clarity and inspiration in your writing. Boundaries and limits. Great blog. To me it seems like everyone walking this Earth tip-toes around ideas whether from an imformal way or a cultural point of view. Knowing people’s limits and boundaries will be great to either relate to them or avoid them. People’s insights and values are important to recognize and respect.